Every now and again something comes along that makes you sit up straight and take notice. This product is one of those things. We are all used to tactile live in-person research and book/hard copy research. We are now so used to Internet based research we get upset when our Internet connection fails. Now this product, "Terrain Modeling" by Compendium Films in their Expert Model Craft series, enters us into affordable deliverable movie-based technique research. This DVD brings book based step-by-step matters to video. Its basic layout mimics that of a book and covers the basic techniques for two overall diorama bases. One is a rural wooded scene and the other is an urban bombed out building. This DVD is a bit dissimilar to current modeling books that cover two or three projects in depth to flesh out specific detailed techniques. In book form at the end the author shares the output of a well done model. In this DVD a completed project is shown in its entirety up front and specific skills were then explored that ‘could’ be put together to end up with a project like the main theme project. Another way to put it is that the DVD does not follow the main projects from inception to completion in a step-by-step fashion, it outlines the skill sets necessary for a successful build ‘such as’ the initial project. The main content area of the DVD is about 56 minutes. Add on the "extras" and your total run time is about 90 minutes. The rural section covers basic ground work. Celluclay was reviewed as the basis for any rural project ground. This material was covered from the ‘what it is’ aspect to the how to apply it and work with it aspect. The author explained what it is, how to mix it, how to use it, and offers some extra tricks. It was nice because throughout the DVD you find nuggets of knowledge that span continents and cultures. Celluclay in Britain may be Paper Mache in the US; this and others are touched on. Herbs are covered extensively. The author goes into various options as far as which to use and how. Off the Shelf products are discussed quite nicely as options. Ground Scatter/Litter is one thing that gets over looked in discussions many times. Builders get wrapped up in the grass or leaves that they forget branches and twigs lying about; not in this video. There is a nice discussion about where to find items and how to use them. The mechanics are quite easy; the reminder is they key point. Lots of options are covered from PE after market vegetation right to elements collected from nature. This section is wrapped up with a long in-depth discussion on how to create plaster rocks. The author takes you through pouring, gluing, painting and weathering. Again throughout the discussion there are lots of tips and tricks. 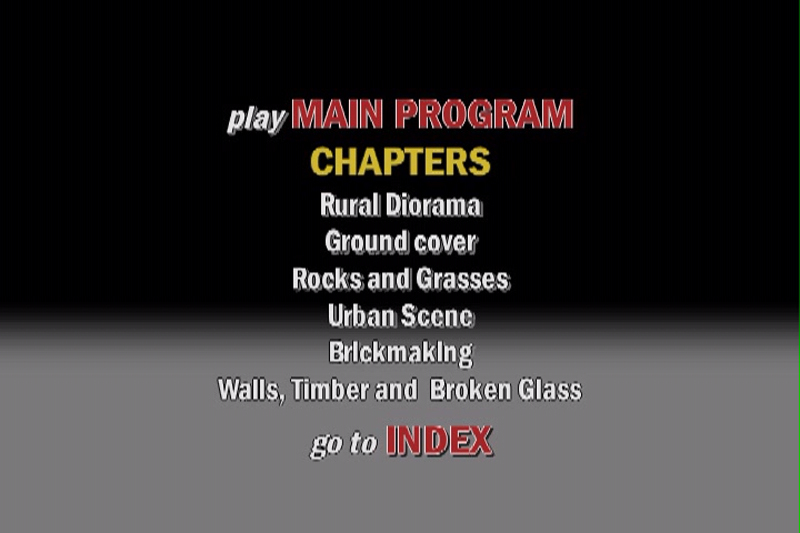 This DVD focuses on a destroyed city flat. All aspects necessary to build a bombed out building are touched on. Some are simply discussed and pointed out with the use of completed diorama as a prop. Others are given more attention and get individual lessons. Making brick walls and individual bricks, timbers, and glass are these topics. I believe they selected these because they are the foundation of most urban scenes. If not literally the base pieces, the techniques used can be altered slightly to create other related urban subjects. One nice point is when Richard Windrow uses balsa foam for a full wall. This product is talked about quite a bit on internet forums, but not many written articles are done with it. It was nice to see. Another nice point covered is the use of scientific slide covers as 1/35 scale glass. Both are nice to see in video form. The last major part of the DVD was the Extras. Many popular movies distributed on DVD now include extra scenes that got cut out or alternate endings and most are just ‘ok’. This DVD includes some great tips and tricks in its Extras. These are a great bonus and make it seem like you get two products. This DVD represents one of the newer means of distributing the knowledge and research we all talk about. Twenty years ago we had the local library and whatever books were there, and then we got home delivery of periodicals/magazines. The internet opened up huge avenues for information sharing. This DVD is another step on the delivery path. One thing I see requested over and over in forum is a ‘detailed Step by Step’ on a given technique; then follow-up questions on a specific step. In print and static pictures it is very time consuming and difficult to convey some modeling technique. Full motion video provides just the filler for this gap. You can see and hear the explanations as you go. You see the speed of movement and get a better sense of ‘touch’. You can gauge how strong or light movements are in video. The video itself is very well done. The film work is good and focused. Transitions are nicely done. Each shot is laid out well and is very economical; there is not a lot of fumbling around for materials or tools. The script is very natural and direct. Richard shares a great deal of information in a natural tone and tenor and does it in a professional manner. I really enjoyed watching this DVD. It was nice for me to see and hear about techniques I have read about so many times. I did learn some new techniques, and new products, and was reminded of things from projects gone by. I offer a two phased recommendation on this DVD. If you are new to dioramas, either just starting in modeling or you’ve built individual subjects and a want a full diorama, this DVD is for you. If you have built a number of dioramas and have a library of references, you may want to wait on this one. The techniques in this are solid expandable extendable techniques that can really jump start a new diorama builder. So, for those who need a good starting point and a great start to a reference library, this is great. You will not be disappointed. Put this high on your list of items to purchase. On the other hand those who have the hard copies by this author (or others) will not necessarily benefit a great deal. Either way you go for the price its a value, there is a lot of content in there. I'd spend the money on the video before a book. Highs: The delivery medium, you get to ‘see’ how things are done. The ‘extras’ section is fantastic. You’ll find inspiration everywhere; there are lots of completed dioramas displayed. It’s reasonably priced. Verdict: For new dioramists this is highly recommended buy this before printed material. For experienced modelers this is lower on the list.